In my latest learning tree newsletter, I discussed analysing some of the salary survey data that the good folks over at BrentOzar.com collected and made available back in January 2017. The data is very interesting and in my first post on this topic over the learning Tree blog, we looked at using some simple SQL statements to query and analyse the data. In this post we will take our analysis a little deeper and look at how the survey breakdown by country. We will also be particularly interested in the breakdown between permanent employees and contractors/freelancers, starting by looking at the breakdown by country. In the first query, here we will look at the average (mean) salary grouped by country (we’ll use the Group By clause and group on the Country column). We'll also use the RANK function to allocate a rank (or position in a list – think of a golf tournament or leader board or league table), to the average salary of each country; show where in the world pays the best for a data professional and where the pay is not as high. 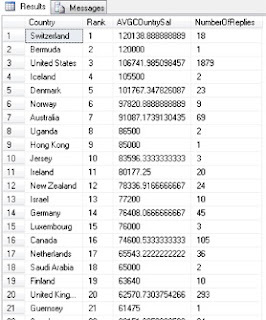 I'll use the count (*) aggregate function to look at the number of replies from each country. This is quite important to see how good a representation the mean salary is for country. To get this breakdown we need to introduce the Group By clause. With a Group By clause we get a result of the aggregate (a calculation) for each group specified, in our case country. We can see the UK comes in 20th place from a total of 66 countries. I was a little shocked initially to see that, but then I thought about the data some more. There can be a number of reasons for this relatively low position of the UK, as at the time the survey was taken; value of the dollar to the pound was not good if you’re paid in British Pounds. £1 would buy you $1.23. I have seen this as high as £1 buying $2.12 over the last 10 years. So we have to factor in the exchange rate here affecting the non-US responses. 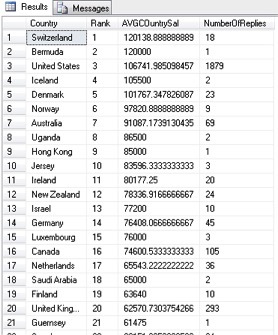 At the time the survey was taken, Switzerland has the highest average and has 18 respondents. Having visited Switzerland I know it’s an expensive place to live, the United States comes in third and has the most respondents. It’s not possible with the data in its current form to break that down further to state and region. The US is a big place and I suspect there will be discrepancies between the different states and regions. I’m speculating here but I suspect the salary of DBA Sheboygan Wisconsin will be different from that of DBA New York City, but we can’t look at that with the data in its present form. What I’m interested in looking at in this post is the difference between Permeant and Freelance in the UK. I'm going to take the UK people who replied to the survey and stated their role as freelancer to be a consultant/contractor. That is a third party, running their own business and supplying services to businesses. They are not employed by the company but providing services for a fee. So I suspect to see quite a contrast in these values of contractors compared to permanent company employees. It comes down to the risk and reward quandary. Generally speaking, the higher the risk the higher the reward. One of the questions that I get asked a lot when delivering training especially when people get to know me and how my business works is, do you think contracting would be for me? My usual reply is”I can’t answer that for you.” However, I’ll happily talk to you about the advantages and disadvantages of running your own business, which is what contracting is all about. There is much more to consider than just money but if that is a factor for you, it may influence your decision. Knowing the difference between permanent employment, contracting and take home pay, may or may not affect your decision making…So let’s look at the figures. $58,480 coverts to roughly £47000 so there seems some parity and similarity in the results of the two surveys. Contractors/freelances according to the survey can earn considerably more, but this needs to be balanced out and considered in full context. There will be other things included for a full-time employee; that are not included in the salary. The list goes on but these are things I point out to people when they see the initial figures above and immediately think they will be better off contracting. They might earn a little more but there will be extras included in a full time role that are contractors do not get. Remember as your own boss you will need to make sure you have provisions for these from your income. A permanent employee would not. If you are looking for a new role or want advice on your job search do feel free to reach out to us. On both twitter and LinkedIn.